Aengus Ó Snodaigh says his use of 434 printer cartridges between 2007 and 2008 – costing over €50,000 – was merited. 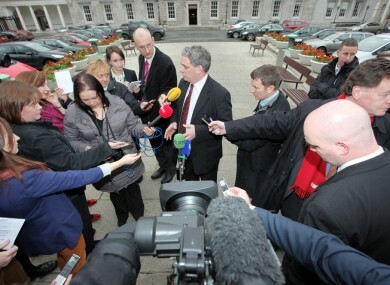 Aengus Ó Snodaigh takes questions from the press outside Leinster House earlier today. A FIANNA FÁIL SENATOR has urged Sinn Féin’s Aengus Ó Snodaigh to “come clean” on his use of Leinster House stationery, after it emerged he had taken over €50,000 worth of printer cartridges in just two years. A report in today’s Irish Daily Mail revealed that the Dublin South-Central TD used 215 toner cartridges supplied by Leinster House in 2007 – in a year when the Dáil only sat for 76 days. The following year he used another 219 cartridges for the Oireachtas-supplied Dell printers – when the Dáil only held public sittings for 96 days. Between the two years, the 434 cartridges – which would cost around €55,000 on the Mail’s estimates – equated to roughly 2.5 cartridges every sitting day. But this morning Ó Snodaigh defended his use of the Leinster House resources – and denied that a clampdown on the use of cartridges, introduced in 2009, was a direct response to his use of the Oireachtas stationery cupboards. Fianna Fáil’s Thomas Byrne said Ó Snodaigh had used five times more toner cartridges than the nearest TD, and said it was “impossible to see how he could have got through this volume of ink cartridges without using them for election material, private use or some other purpose. “I run a busy constituency office, with weekly leaflets printed on a constant basis for a variety of issues and my spend in 2007 was just 6 per cent of what he used,” Byrne said. Ó Snodaigh told RTÉ’s Morning Ireland that his constituency organisation “would have been known as the most prolific leafleters in the country, within the party,” and that the toner would have been used to print these leaflets. “There was quite a lot of printing, obviously, and it was used for constituency purposes – leaflets locally,” he said. This would be an expensive business because leaflets would “have to print pictures so that people can capture the size and scale” of any planned construction projects, he said. “We would have had tens of thousands being delivered weekly at some stages in those years,” the TD – who is serving his third term in the Dáil – said. Hindsight’s a great thing – it looks excessive, but the amount of material I was printing was at that scale, and it was being delivered door to door in that scale. Nobody ever raised with me, in Leinster House, the cost of it or that it was excessive, or anything else. Ó Snodaigh added that because Sinn Féin had a far smaller Dáil representation at the time the toner cartridges were received, it did not get priority access to the printing presses in Leinster House – and had to use desktop printers supplied by Leinster House instead. He had since suggested to the Leinster House authorities that the office printers supplied to members by Oireachtas authorities were “not suitable for the type of work they have intended from them,” while Sinn Féin has since been supplied with an industrial photocopier for large printing. The use of cartridges had lessened in the meantime as Sinn Féin was able to better communicate with voters through the internet and social media, he added. Ó Snodaigh insisted he had not used the cartridges to print any election literature – claiming the Leinster House stationery office actually shut during election periods to make sure taxpayer-funded resources were not used in an election. He also said no resources were given to the Sinn Féin party centrally – which would have been explicitly barred under rules governing donations to political parties, which disallow the donation of goods or services paid for by the taxpayer. Senan Molony’s report in today’s Irish Daily Mail adds that new rules introduced for 2009 – when Ó Snodaigh remained the most prolific printer, using 54 cartridges – mean TDs have to pay for any cartridges after an annual allowance of €2,000. Ó Snodaigh still owes Leinster House some €3,707 for cartridges used since then, but said on RTÉ he had no problem paying that bill if it was due. Email “Sinn Féin TD urged to ‘come clean’ over €50,000 use of Dáil printer cartridges”. Feedback on “Sinn Féin TD urged to ‘come clean’ over €50,000 use of Dáil printer cartridges”.